This warm copper-colored wood picture frame features a metallic finish that is made to look like forged copper, including marks that represent air pockets from molten metal that has solidified. The profile width is 1 5/8” and the rabbet depth is a substantial 1 3/8”, making this warm copper wood picture frame ideal for anything from stretched canvases, to matted works on paper, to beveled mirrors, and much more. Interiors with warm brown and orange tones, such as French or French-Country, Mexican, and Southwestern design settings are all possible matches with this warm copper wood picture frame, whether paired with terra cotta and beige colors, or ultramarine blue tiling. Other possible design settings include Machine Age, Medieval, and Arabian styles. 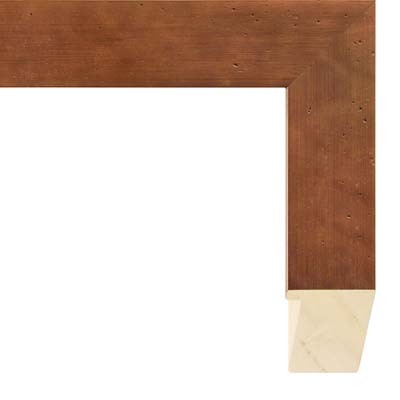 Art styles, genres, or subject matter that would be suited for this warm copper wood picture frame includes documents, diplomas, and awards, along with warm, monochromatic paintings on canvas such as figures, paintings of pottery or jewelry, hot desert scenery, and beveled mirrors in contemporary bathrooms. For works on paper, consider matting your art with acid free archival mats for our offerings such as Sand Trap 9513, Wet Sand 9515, Brown Sugar 9586, Blue Night 9830, Deep Blue 9889, Bruxelles 9853, Olive Branch 9532, and Russet 9834.